Get affordable Security Camera installation on El Monte, CA and CCTV equipment with commercial quality and 2 years warranty. We have been working on El Monte since 2005; we provide high quality security camera installations. The equipment that we install has commercial grade quality, and we offer the best price in the market. There are many reasons to install a security camera system in your business. When you have a security camera system your employees know that they are been watched, so thefts are far less likely to happen. You will have your inventory and productivity in order. In the other side of the coin you can have shoplifting: criminals want to pick easy targets. With a security camera system you can detect this problems or shopping patterns of your customers. You will be able to make the changes of your store to promote productivity and avoid shoplifting. To solve disputes about bill denomination, is necessary to have a security camera at the register, this camera has to be well positioned in order to see the bill and activities around the register. When the customers fell down in your business on purpose is a big issue; you can be sued. If you have a security camera system you can extract the video of the event from the HD-DVR, this will give you a strong position on court; you can save the day. In the case of break in is good idea to keep the HD-DVR hidden. If the criminals can’t find the HD-DVR you will have the recording of the event. This will give you a chance to recover your property and find the people responsible of the crime. Accidents have to be avoided at all cost. If you have machinery that has to be operated by employees, you have to be sure that the machine is operated in the right way. Install a security camera near to a dangerous machine give you the power to control and supervise the production and security of your business. Protection4Less offer commercial quality products with 2 years warranty. 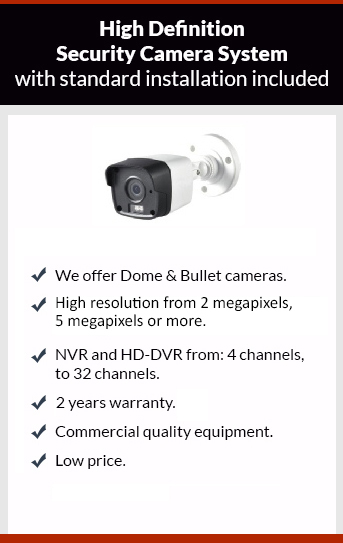 If you want the best security camera system at the right price for you, just give us a call. The estimate is free.